mattsnellmusic.com: Why Wasn't I Told About This? Why Wasn't I Told About This? It seems like no one tells me anything anymore. 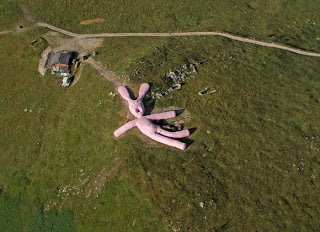 How else to explain that it took me seven years to find out about a giant pink rabbit in the Italian Alps? That's seven years down the friggin' toilet as far as I'm concerned. Luckily the rabbit is not scheduled to fully decompose until 2025, so there's still time. If the rabbit were merely large, I wouldn't be so upset. 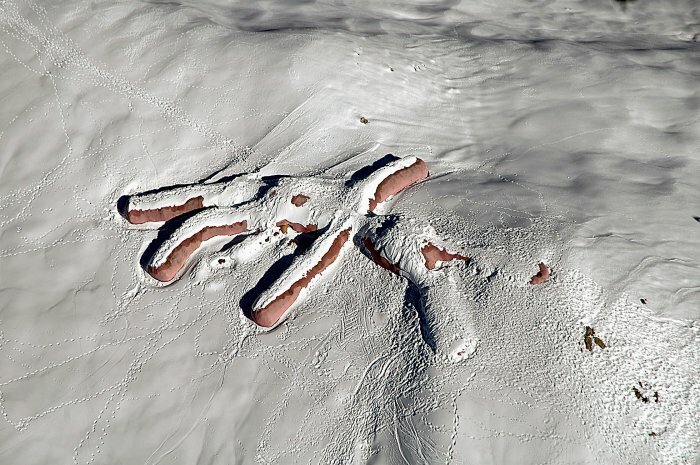 But this one is two hundred feet long, twenty feet high, and visible from space. It wears an expression of lobotomized horror and yarn entrails spill from its side. If you don't believe me, go to Google Maps and search for Colletto Fava, switch to satellite mode and zoom in. 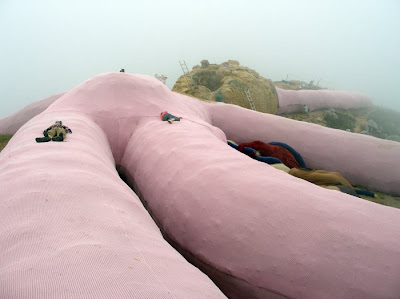 The rabbit is so big it took five years to complete, most of it spent whipping grannies until they knit faster. 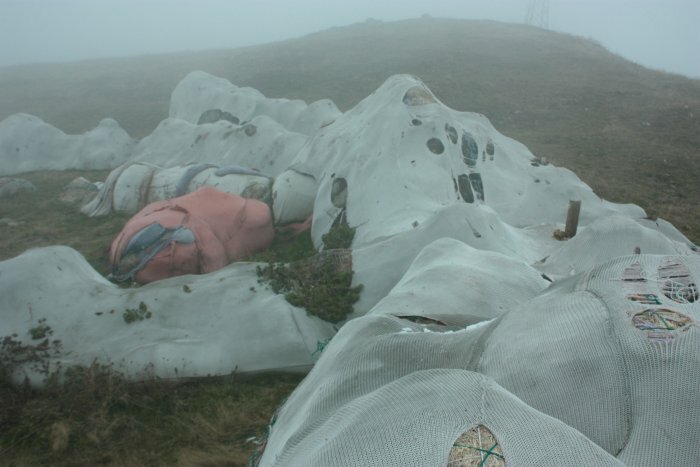 Gelitin, the Viennese art collective that conceived the project, then dragged the shell up the mountain and stuffed it with straw. Though it has already begun to decompose, hikers are still welcome to climb up the rabbit and rest on top, or in the words of Gelitin, "Happily in love you step down the decaying corpse, through the wound, now small like a maggot, over woolen kidney and bowel. Happy you leave like the larva that gets its wings from an innocent carcass at the roadside. Such is the happiness which made this rabbit." Gelitin worked up to the project with other scandalous and bizarre labours of love, including Arc de Triomphe, a two-thousand kilo plasticine sculpture of a man peeing into his mouth, and Zapf de Pipi, a monument of frozen urine. With a track record like that, you could almost call a giant plushy selling out. What were we doing in 2005? 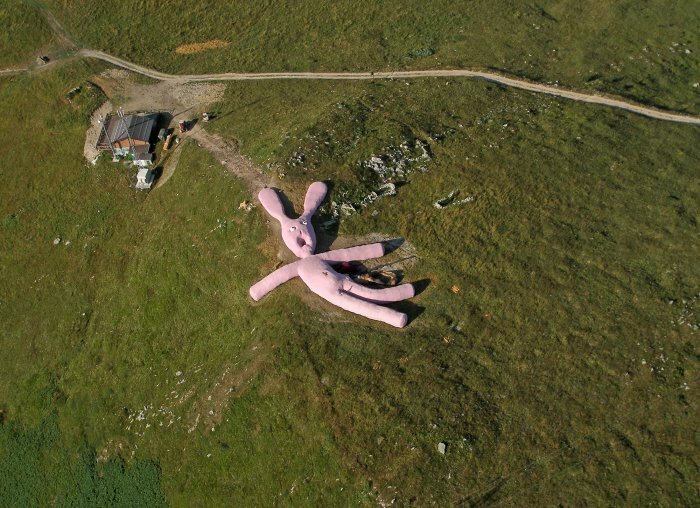 Whatever it was, it wasn't as good as going to see this giant rabbit would have been. Anonymous, you couldn't be more right. I'm sorry, Matt. I thought for sure that I told you about that. Oh. Well it's also your responsibility to make sure I'm paying attention.